The San Diego Collaborative includes diverse representatives from over 30 organizations across San Diego County. Since its inception in 2012, the Collaborative has worked to identify and address numerous issues surrounding local marine protected areas, beginning with a successful request to the Fish and Game Commission to add “La Jolla” to the Matlahuyal State Marine Reserve for identification purposes. Members have spearheaded signage installation and development, and produced and distributed 10,000 recreational brochures and fishing guides across San Diego County to enhance local understanding and compliance with marine protected areas. They have also worked to integrate Kumeyaay tribal practices and history into local interpretive panels and recreational brochures. If you are interested in participating in the San Diego Collaborative, please contact co-chair Zach Plopper. 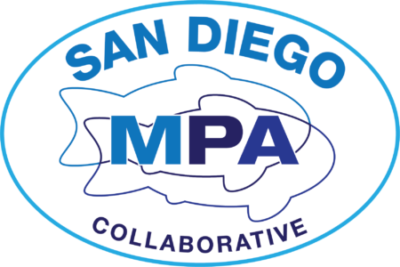 MPA Outreach Toolkits: The San Diego MPA Collaborative developed MPA Outreach Toolkits for educators in the San Diego area. The Toolkits include lesson plans and activities that help educators teach about the science of MPAs. MPA Wildlife and Recreation Guide: A brochure developed for San Diego County recreational users is being updated and printed. The “Floating Laboratory” Project: WILDCOAST, partnering with Crystal Cove Conservancy and Seaforth Landing, takes students on citizen science cruises in the South La Jolla MPAs where they gather and analyze data on marine wildlife and ocean conditions. The initial trips are scheduled with students from Sycuan, Valley Center, Jamul, and San Ysidro. If you would like to volunteer on one of these outings, learn more about the project for a student group you are connected with or join as an elected official/agency representative please contact San Diego MPA Collaborative Co-Chair, Zach Plopper.